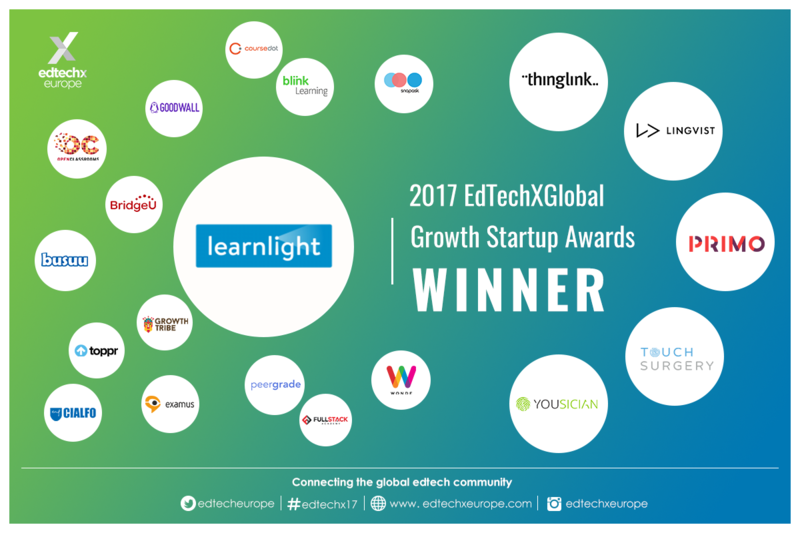 London, 22 June 2017: Learnlight, one of the world’s leading providers of blended language and skills training, today announces that it has won the 2017 EdTechXGlobal Growth Award at the EdTechX All Stars ceremony that took place last night in London.This award recognizes the fastest growing and most innovative startups across the worldwide EdTech industry. The 2017 EdTechXGlobal All Stars Awards is decided by a panel of judges from across the globe who evaluate several key factors including sales, size, attitude to innovation and market impact of services/product. The awards aim to showcase the top three start-ups across geography, segmentation and industry trends in each category. EdTechXEurope is the leading thought leader summit bringing together executive level investors, innovators and industry influencers from European and international education companies. Now in its fifth year, EdTechXEurope 2017 hosted 850+ global attendees and invited over 150 speakers to showcase EdTech innovations and perspectives from around the world.